And a lesson in finding my own way. I'd watched raccoons last night, sitting in the dark of my living room, the only light that of the tv. They'd hurried back and forth past the front door several times for what reason I know not, looking for pecans or a warmer spot or just moving, moving to keep the cold at bay. They were there on and off for an hour, entertainment for Maggie and me, then gone into the night. This morning I deleted yesterday's post, unhappy with it, I'd felt I just needed to write something, which was true, but no need to post everything. It was in my dreams, that thought it needed to be gone, so gone it was when I was up and the computer on, the virus scan finished. 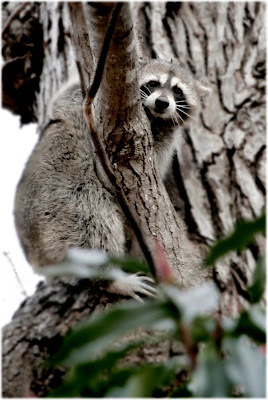 I sat with the morning - lesson #1, I will always sit with the morning a bit, feel what it has to tell me - and was rewarded with a daytime raccoon, no way to know if it was one of my nighttime visitors, scuttling across Mary's yard and driveway, limping a little, a big raccoon. I watched as he rustled his way up through the bush at the end of her driveway, the one whose name I've never known, and then into the tree, I think it's an oak, I am quite terrible at knowing what they are when the leaves are gone, I will ask someone later, but up into the tree he went and I watched, knowing there was a scooped out spot more than halfway up, a raccoon place, I've seen them there before, and then a second raccoon appeared from the same direction, a smaller one, a younger one, caught out in the daytime also, and up he went and uh oh, thought I, only room for one, and so grabbed my camera, threw a jacket on over my pjs and was out the door just in time for the fight to begin, the screaming and scratching and brawling all at that empty spot in the tree, and in just a moment that first raccoon, the big one, was scooching down the tree, stopping when he saw me, resting against a small limb. the small raccoon staring at me from his hard-won place of warmth. A few pictures, a few words with my neighbor, and I headed back to my place of warmth, settling on the couch to see what would happen. Soon, catching his breath, raccoon #1 headed back up the tree and threw the youngster out, who hurried down the tree and headed to the back of Mary's driveway, under cars, behind or under the house. Lesson #1. Sit with the morning. Lesson #2. The cold won't kill me. catch my breath, look around. to a new home as her last days were here. though she was a terrible navigator. WOW... Now here's a lesson. Love this. Sit with the morning. The wisdom of raccoons...so cool. It can teach you how to mask, disguise and transform yourself. Don't you act differently with your boss, parents, children, husband, friend, strangers. Those are all masks you put on. Masks are one of the tools of transformation. It helps us to change what we are into what we want to be. and awaken the aspect of yourself that is. If you are a Raccoon person, eating mostly fruit and vegetables will be beneficial to your health. 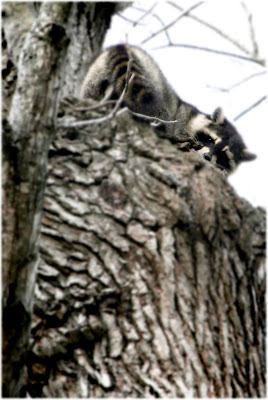 A Raccoon totem has a long influence on your life. It is not a short-time totem, but rather will stay with you for a long time. the second photo = love! i'd love to see one in real life--it's been so long, as we don't have them here--and this was a treat. Caroline - Yes, I do wear all those masks, but one by one they are being tossed. My totem is the hawk, I believe. Mary's, however? No doubt it was the raccoon. I really love Caroline's words about the raccoon totem and the different masks we wear. I think that is so true of everybody. A good lesson to learn from your raccoon #1. Good lessons, all. the lesson i learned from raccoon #1 is "don't give up without a second fight." and i need to practice your lesson #2. I am a big baby about the cold. I remember standing by my door once, terrified that someone was about to break in. I could hear steps on the gravel outside my door. It went on for such a long time that I finally braved it and opened the door a crack to see what was going on. There were 4 raccoons standing there looking at me. I had left a bag of garbage by the door to take out but had forgotten about it..they had ripped it open and two of them were fighting over some treasure they had found in there. As I quickly grabbed the bag and put it inside on the kitchen floor, I stood there for a minute watching them..they were so close..one of them was within reach, trying to get past me and into my house so he could have the garbage bag back! They weren't afraid of me at all! I, on the other hand was not so brave. The last thing I wanted was a raccoon bite, so I quickly closed the door, thankful that the intruders were of the animal variety and not human!